By combining viral marketing and social networking you can really explode your traffic. We tested a very early version of the ContestBurner WordPress plugin and generated thousands of new visitors to one of our sites in just a few weeks. It’s Bill checking in… this contest plugin is amazing! I’m definitely going to get the WordPress plugin for my blog! This is such an amazing wordpress tool and I am really looking forward to using it on my blog! Let the contest begin! Will the elite members get access to the upgraded plugin soon? I am sure you will be increasing the amount of new Elite members as well. Elite is an amazing coaching program. Thanks Bill! Thanks For all of your coaching… You have helped me out in many ways. Bill this contest is awesome and very exciting. I cant wait to use it for the Elite members! Another great product from Bill Mcintosh. Boost your traffic now! Another great product from Bill Mcintosh. Bill continues to be one of the best on the internet! I cannot wait to use this on my blogs and websites. Thanks for the amazing and outstanding FREE lessons in online marketing. Now it’s my turn to show my appreciation. I wrote a blog post about this plugin. Thanks Bill, I can’t wait to use it. I appreciate all the marketing techniques you have taught me. I have been following you since the “social dominator” experiment. This Contest is incredibly addicting. Here I am supposed to be getting ready to head south for the winter and instead I am looking for ways to get more entries into Contest. 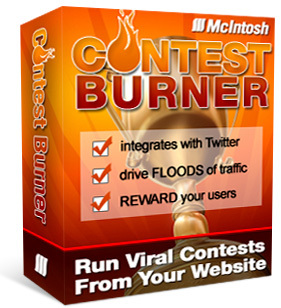 ContestBurner sounds like a must have tool for WordPress. Looking forward to using it on my blogs. ContestBurner has doing things I’ve never done before! See my first YouTube presentation at ContestBurner Rocks the World”. Am really bummed. I missed the live show due to family obligations… Watching replay of show, hoping I will find out how to get ContestBurner plugin by the end of show. Thank you wonderful guys for your quick work at posting recorded show and links to the FREE contestburner plugin..